Last week, we learned that the characters 川菜 appearing on a restaurant sign or menu indicate that Sichuan cuisine is served. If you recall, the 川 character, pronounced ‘chuān’, frequently appears alone as an abbreviation for 四川, or ‘Sìchuān’. Now take a look at the above picture… You will easily be able to find the川菜 characters again. Even without any English words as a help, you can correctly conclude that both restaurants in question have Sichuan dishes on the menu. However, that does not tell the whole story as both places, in fact, specialize in two different cuisines and we can tell that by looking at the character immediately preceding the ‘Chuān cài’ characters …. Here is the new character. It I not easy to tell at first, but, like our ‘Grass-Claw-Tree’ character (菜), it also is divided into three separate, vertically-arranged components. We will be looking at character components in a much more systematic way later on but, for now, you can think of ‘Jing’, or the ‘Capital’ character, as being made up of ‘lid’, ‘mouth’ and ‘little’. You may remember we encountered the ‘little’ component as a stand-alone character two weeks ago in 小白菜, or ‘Little Bok Choy’. Personally, I always think the 京 character looks like a little octopus wearing a hat! The two restaurant signs pictured above don’t specify their cuisine (at least not using our 菜 character), but the names do contain 京, or ‘jīng’. Given the translation of Jing as ‘Capital’, and recalling that ‘Peking’ is an older rendition of the modern ‘Beijing’, you can now probably get an inkling of what sort of cuisine is on offer when the character 京 occurs on a restaurant sign. By the way, as a little aside, you can now commonly come across ‘Jing’ in a different situation. Here ‘Yanjing’ Beer (which is very good) is named after the ‘Capital’ of the ancient Chinese ‘Yan’ kingdom. I am not 100% sure (and it scarcely matters), but I think Yanjing was in the same place as today’s ‘Beijing’. I chose to feature Sichuan cuisine last week as it quite common to see restaurant signs specifying 川菜 and so this is something you can easily keep an eye out for. Many restaurants also serve dishes native to the capital region and you quite often see 京 coupled with 川菜, as in the above examples. The above picture is interesting for a couple of reasons. Here, the 京川 are followed by two different characters that, together, represent one of the many ways of saying ‘restaurant’ in Chinese characters. What is important to note is that it is possible to specify the cuisine without actually using the 菜 character. The other noteworthy thing is that the English on the sign uses the word ‘Mandarin’ rather than ‘Peking’ or ‘Beijing’. When you see this on a restaurant sign it is a good indicator that 京菜 is on offer. 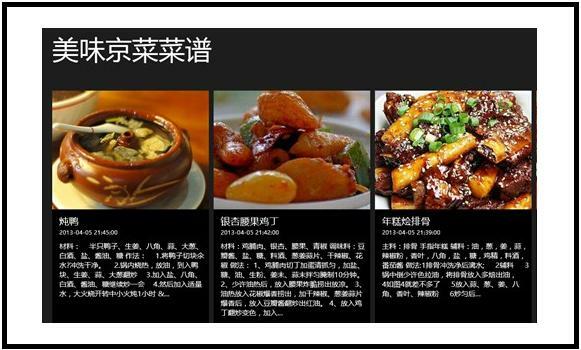 Above are 3 examples of usages that just specify Beijing cuisine (that is, no Sichuan dishes as well). By the way, since Beijing was once the home of the Imperial Court, the words ‘Imperial’ or ‘Royal’ are often used in Restaurant names featuring northern or Beijing dishes. Now, of course, you would be able to tell what sort of cuisine is served at the ‘Imperial City Bistro’ even without it being spelled out in English! The 京菜 characters are fairly easy to spot in the above picture but I am including this example for a couple of reasons… First, why do you suppose the 菜 (Grass-Claw-Tree) character is repeated in the first line (as a hint, it has to do with the character which follows, but we’ll get to that in a future post). Secondly, do you recall encountering the second character (味) in our post last week? I mentioned that we would discuss that again, didn’t I? It is fascinating and a wee bit frustrating that my ability to identify these characters is so greatly influenced by the font. Absolutely … handwritten signs can be almost impossible for me. Very interesting lesson. Thank you! Lovely laryers of teaching being added each week! Think I’ll begin using an old fashioned pad and making old fashioned notes to practice and remember- am really enjoying learning Chinese culinary symbols this way 🙂 !